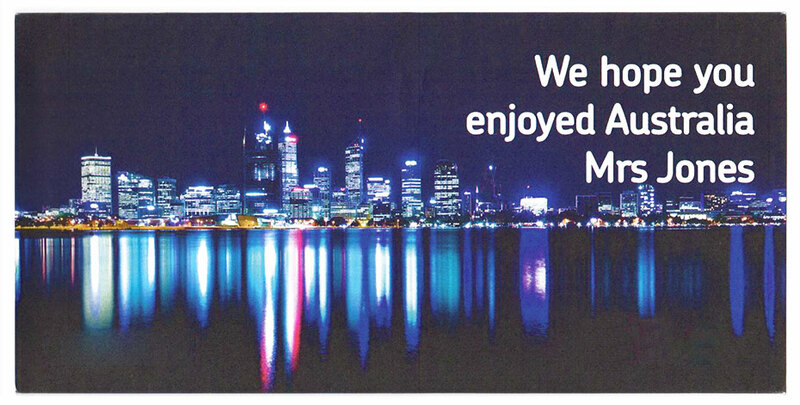 Hughes & Co Design – Is Direct Marketing Dead? The short answer to this question is No – direct marketing is very far from dead, according to Colchester marketing agency Hughes & Co Design. But why? How can printed paper advertising and snail mail possibly compete in an age where marketers are enthusiastically exploring online and digital marketing options? To answer this question, we take a look at some revealing statistics from Ofcom and look at a number of changes which are giving this traditional marketing method a new lease of life. Direct marketing involves delivering paper advertising materials to individual homes by post. This method of marketing has been in use for more than 60 years, dating back to an age where most homes did not have a telephone, smartphones were in the realms of science fiction and few had a television set – never mind the internet. Short of calling door to door, direct mail was the best way to get the attention of a large number of customers in a cost-efficient way. So it may well seem as though direct marketing is at least “dated”, if not completely irrelevant. But is this really the case? How Relevant is Direct Marketing? Whether a marketing method is “relevant” should not be judged simply by how old it is or the technology that it uses. Its true relevance relates only to the response of the recipient: if consumers are responding to direct mail, then it is relevant for them. And recent evidence from Ofcom shows that direct mail recipients are, in fact, very responsive to direct marketing indeed. They report that an astonishing 92% of direct mail is opened, and that 48% of people who open direct mail take action based on its contents. Not only that, but nearly a fifth of direct mail is kept for future reference. Response rates aside, direct mail is seen as more trustworthy than online marketing. Many consumers dislike or are distrustful of marketing emails or online offers, especially when they ask for an email address or other personal details, for fear of spam, or worse. In contrast, a letter or brochure arriving in the post is seen as a much safer option. With advantages like these, it’s no surprise to learn that advertisers spent £12.7 billion on direct mail in 2015. So, should businesses forget about online marketing methods and stick to tried and tested direct mail? Again, the answer is No. The best way to use direct mail marketing is to integrate it intelligently into an overall marketing strategy which includes both online and offline elements appropriate to your particular customer base. Wider reach – Not all customers are online, especially in some sectors or for some types of product. Direct mail has the ability to reach customers that online methods may not. Reinforced messages – Direct mail can serve to “corroborate” messages on other marketing channels, such as TV, online or magazines. Or it can help to prime consumers for other campaigns. Alternatively, direct mail can be used as a follow up to a TV or online campaign, improving awareness, recognition and response rates. Retention – People are more likely to keep a physical communication if it interests them, especially for products that have long decision-making cycles such as home improvements, cars, holidays, insurance and so on. Compare this to the likelihood of someone keeping an equivalent email or bookmarking an offer page – and even if they do, will they ever actually look at it again? A piece of direct mail pinned to a fridge or kept in a letter rack is likely to be seen multiple times by a customer over the course of several months, helping to keep the product, service or brand in their minds when it comes time to buy. Gateway to digital – Direct mail can be a way to draw consumers into an online relationship with your business. For instance, direct mail can include offer codes or vouchers that can be used online, or QR codes that can be scanned by a smartphone to bring up a particular page on your website. In addition to the benefits of mass marketing mailshots mentioned already, direct marketing has seen some significant changes, giving this marketing method a whole new lease of life. Personalisation – By far the biggest technological advance in the world of direct mail marketing is the introduction of personalisation. At the simplest level it allows mail to be directed to a named person at a specific address. This allows brands to distinguish their materials from the “junk mail” category – which drastically improves open rates; and make content genuinely more relevant and appealing – which improves retention rates and, ultimately, conversions. However, personalisation can also be used to customise the materials inside the envelope, including text, graphics, individual URLs and more. It also allows content to be varied to reflect a particular customer’s known interests or other features such as age, birth date, recent purchases and so on. 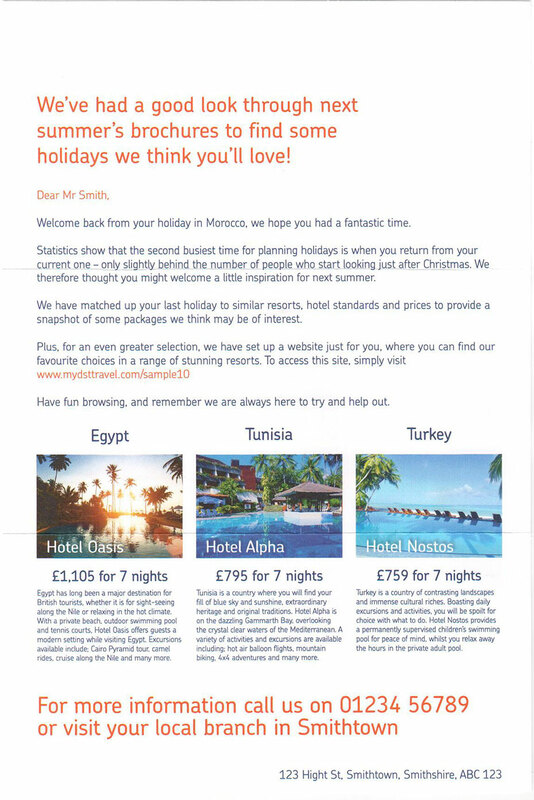 In this example, Hughes & Co designed personalised direct mail for a travel company, using the customer’s name within the graphics, to create a completely unique item for each customer returning from their travels – providing an eye-catching way to present offers for similar destinations. 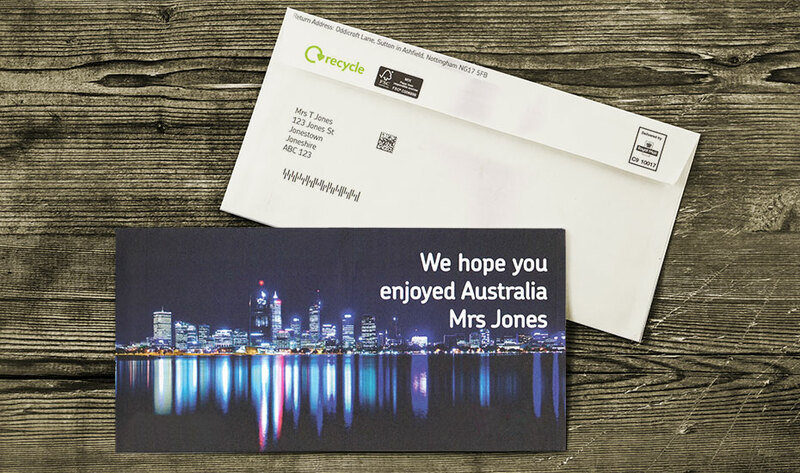 Localisation – Another growing opportunity for direct mail is the increasing emphasis on “local” as a way to generate a greater sense of connection between a brand and its customers in a particular area. For instance, a national brand may use TV or online channels for national messages, backed up with local messages delivered via direct mail, local radio, local press, and so on. For instance, a national chain of stores can send out localised mail which features their local store, personnel who work there, special offers available only in this particular store, and so on. Hughes & Co design and implement personalised direct marketing campaigns, combined with a range of digital marketing techniques, for our clients in Colchester, London and beyond. So whether you are a local company looking for ways to grow, or a national brand wanting to connect better with your customers at a local or even a personal level, we believe that creative direct mail marketing is a channel that deserves a closer look. Direct Marketing – Call us now to find out more about how direct mail can help your business.